Galactic Year Zero, also called 0 BBY, is the part of the year that preceded the Battle of Yavin in the Galactic Standard Calendar. 0 BBY and 0 ABY collectively comprised a single year. BBY refers to “Before Battle of Yavin” and ABY “After Battle of Yavin. It is a time when tyranny and oppression mark the reign of the Galactic Empire, threatening to extinguish the last flames of freedom. In this dark time emerges an alliance of rebellious heroes intent on overthrowing the Emperor and restoring the glory of the Old Republic. Shortly after the completion of the Death Star, Palpatine dissolved the Senate. From the beginning of the Galactic Empire, Palpatine sought to remove it. The first reason was symbolic: he could not leave a reminder of the Galactic Republic. Despite the Imperial Senate being very different from the Galactic Senate, it came to be known as the “last remnant of the Old Republic.” The second was political: some senators still opposed him. His obedient majority tried keeping them in check; they understood they were only there to prop up the illusion of democracy. Some, however, didn’t understand the sham; they actually tried passing laws against the Emperor’s wishes. He dealt with the outspoken ones when they appeared, but like weeds, others sprouted in their place. Some of them, as Palpatine suspected, were providing the Rebels with funds, information, and resources. 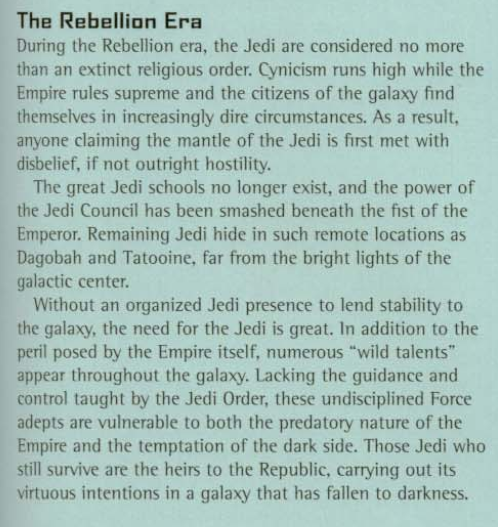 In addition, the Imperial Military via its field manual explained that the Imperial Senate was only intended to serve as a transitional piece between the Old Republic and the New Order, and claimed its removal will ensure that the Imperial Military will do its duties much more efficiently. During this time, many events take place that define the beginning of this new era. First, the Rebels have joined together to form the Alliance. Up to this point, they had been mainly three major factions acting in an unorganized fashion. Thanks in no small part to the trap set by Darth Vader to bring the Rebellion Leaders together in one place, the Alliance is formed. During this same time, the leaders of the Alliance become aware of the Death Star. 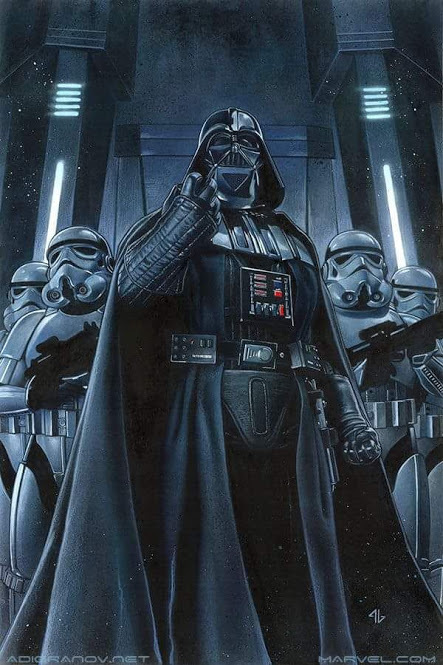 Operation Skyhook is in full swing during this time, and Darth Vader is obsessed with fulfilling his vow to his Master to return the fragmented plans for the Death Star. The Sith Lord has blazed a trail throughout the Galaxy, hunting down the Rebel factions who always seem to be one step ahead of him. As the Death Star is completed, the first test of the weapon is used on Despayre, wiping out the planet and proving that it is fully operational. 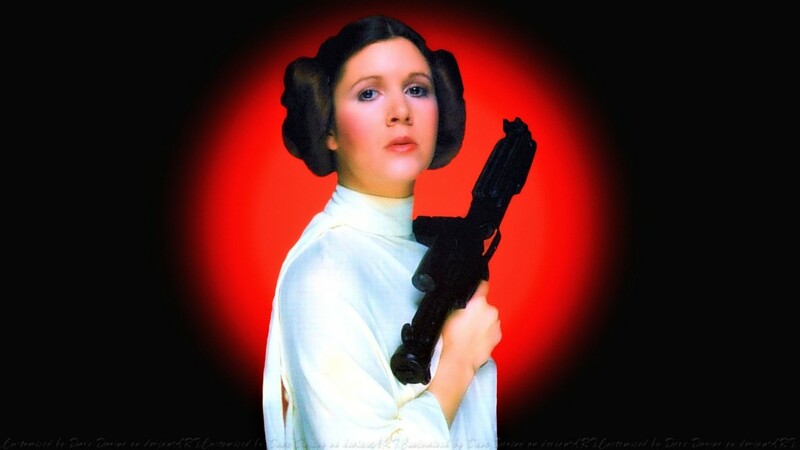 A short time later, the weapon would claim Alderaan as its second victim. Year Zero is an exciting time in Star Wars history. It is the lead up to the movie, A New Hope. And the Rebellion Era continues throughout the events of Empire Strikes Back and Return of the Jedi.